This is what they’d call a ‘showstopper’ on The Great British Bake Off but is actually quite simple to make. It would make a nice family baking project around the holidays. It would also be the perfect way to use up the mixed fruits that are lurking at the back of your cupboard, too. Allegedly, it’s lovely the next day sliced and toasted under the grill. I doubt that we are going to get the chance to find out – it’s been out of the oven for 45 minutes and there is less than half left! Makes 12ish slices. For us, that’s meant ‘serves 4’! 1. Put the flour, sugar, yeast and a pinch of salt into a large bowl. Mix the butter, milk and egg in a jug then pour into the flour bowl. Mix well, adding a little more flour to the mix if it’s very sticky. Tip out onto a floured surface and knead for ten minutes (good for your biceps!) Re-flour the surface and roll the dough out into a rectangle around 30cmx20cm. 2. Brush the 25g of melted butter over the dough, leaving 2cm along the far side unbuttered. Mix together the cherries, dried fruit, almonds, spice and caster sugar and spread all over the buttered area. Brush water along the far, unbuttered edge and roll the dough up tightly towards that edge, sealing the dough. 3. Shape the dough into a ring and put on the baking tray with the join on the underside. Cut the dough a few times to let the fragrant fruity mix peep out. Cover with oiled cling film and leave in a warm place until it doubles in size. « Do You Think Like A Runner? 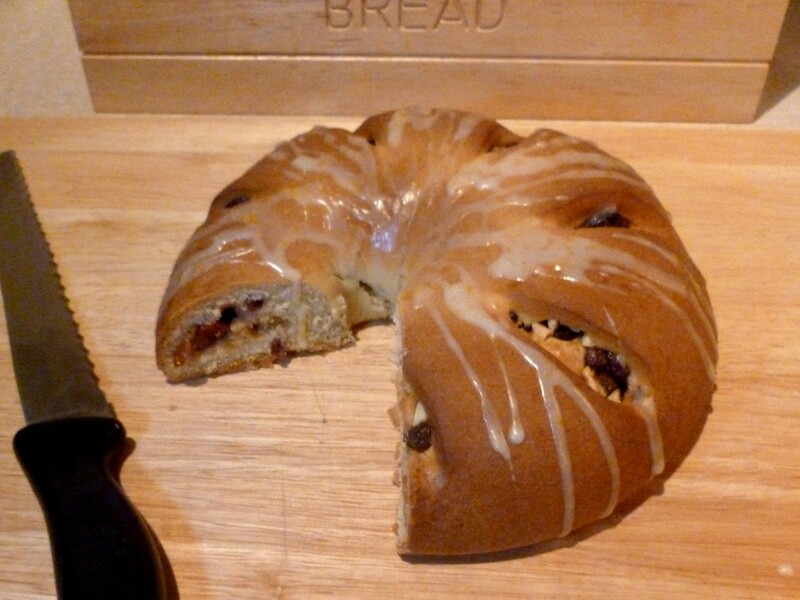 This sounds lovely – especially for someone like me who doesn’t like Christmas cake!